Small game consoles have definitely damaged business for arcade machine sellers, but you still can’t help but love the classic that started it all. Thankfully there are still certain companies that like to make very stylish and current arcade themed furniture. Surface Tension’s Arcane Arcade Table may not be exactly new, but it’s getting some updates to make it an even sweeter deal. The updated version will be getting Sonos ZP90 wireless ZonePlayer, making it possible to make the table a part of your Sonos network. It’s also taking a step up from the original 190inch LCD size and going on up to 26-inches. In addition to that, it’ll ship out with Windows 7. The table currently features Intel i7 CPU, 8GB 1366 DDR3 RAM and 256GB SSD. 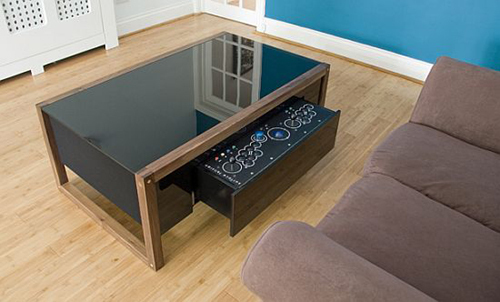 The table itself has hi-gloss sides and a slightly longer control panel that houses 2 x 7-button layouts and a spinner. I believe it goes without saying though that these tables are going to cost you a whole lot of cash.